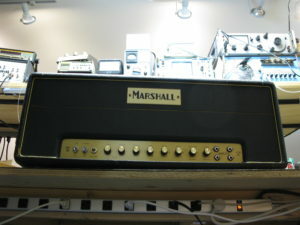 Jim Marshall died on April 5, 2012. Imagine the guitar amp world without this man. Marshall was a music store owner and drummer who gave lessons to Mitch Mitchell. His 100W amp was requisitioned by Pete Townshend who wanted an amp loud enough to keep up with Keith Moon. 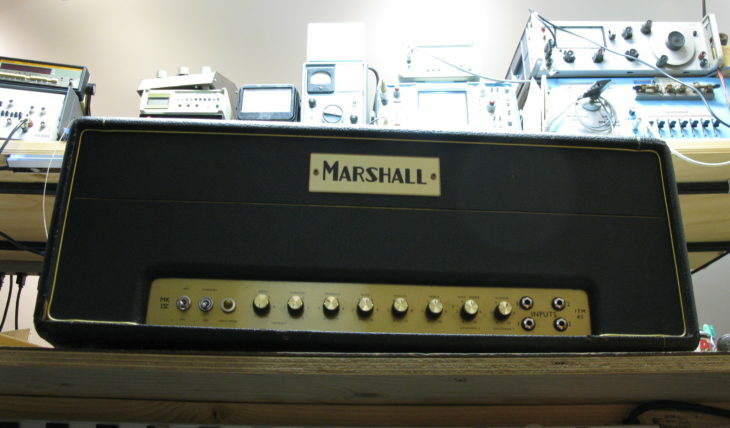 Hence the birth of the infamous Marshall Stack which became standard stage equipment for the likes of Hendrix, Clapton, Page, Deep Purple and an endless list of Rock & Roll greats. A few years back – the very first 100W Marshall built by Jim himself for Pete Townshend came in to our shop to get checked out. Note the two output transformers (one with new bells) and the original quad of genalex KT66’s. 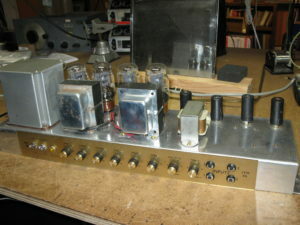 Apparently nobody made a 100W output transformer in 1964 so Jim used two 50W Transformers and simply wired them in parallel. After hearing the magical bloom of this first 100W Marshall pictured here with two 50 trannies tied together, I tried the same technique with my JOAT 30 RT amp. I confess to one trick stolen from the legendary Jim Marshall! RIP Jim – well done good!